with the Kung Fu Funk! Coach is: Ten on drums, Yong on bass, Label on guitar and Jelly on vocals. For three and a half years they've been rocking the festivals from Kenting to Fulong, opened shows for Bobby Chen, Mayday and Wu Bai and China Blue and, just this summer, turned crowds at ICRT's Combat Zone Street Parties into well-oiled funk machines. They chose their name in the spirit that you can do anything and because it doesn't bind them to any particular style of music. Influences like the Red Hot Chili Peppers and Pearl Jam show, but Coach succeeds in creating a sound that is their own. Their first album, "Give You a Tempo", will be released in the spring, a retrospective of the last three years. This month they're releasing a two-song EP of "Beautiful Day" and "Real World". The live shows will give you a taste of the Kung Fu Funk with new material they're already laying down for the second album. It's not just funk paced, kung fu movie soundtracks with Suo Na Chinese horns in the mix--but that'll give you a taste. Taiwan Fun shouldn't have to remind you: You gotta get up, to get down! 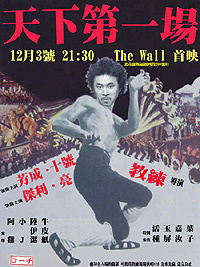 The party is at the Wall on December 3rd.